The cod often casts an eye on our behaviour with our propensity to take paths that lead to misery, both politically and aesthetically. So, in this instance, I feel that it’s my duty to let the cod speak directly. “To put it bluntly, how is it that you haven’t sorted out the idea of your so-called postmodern period; that all started way back in the 1960’s. Also, there is this rather annoying element of the ‘enlightenment’ as a way of thinking, that pervaded the modern movement, that, as Baudelaire put it, ‘Modernity is to develop objective science, universal morality and autonomous art according to their inner logic’. That kind of thinking was in the 19th century, a move towards the emancipation and the enrichment of life. In art you called it progress through the meta-narrative. All that appears to have been ditched. You’re floundering in a mess of pastiche and kitsch in the arts in this present day. I have to listen to my dear old friend or the seas will get even more turbulent. So, my next move, just in case Cod of Codswallop might break the silence, is to set up a collaboration connecting Codswallop with Falmouth University. This event is a performance of dancers, performance artists, a musician, two narrators and two surveillance cameras with projections, with drawings on the ground. The artists will examine postmodern ideas in relationship with the enlightenment and the state of the arts today. They will form a microcosm of the world as it is. Trapped as we are in a cash flow of corrupted economics, cultural mimicry and a circulatory set of ideas brought about by the stench of reason and commerce. I don’t want to be here. The title of the performance signifies the desperation of the artist and their protest. I don’t want to be here trapped in networks of control where values have no meaning except in whirling systems of profit and loss, greed, and exploitation. But as the performance indicates, we fight. We fight ideas of cause and effect, we fight for chaos and imagination against reason. We fight the border guards and heed the voices of the narration as they voice the adventure of not knowing. Not knowing where action will take us, or what kind of reality we will create, is our condition. We explore the realities of culture today to arrive at the ‘Reality of the Trap’. We are sleepwalking into an abyss of our own making. What the Cod in Codswallop is saying is that artists have a duty and a responsibility to actively present the predicament not only of the cultural environment but also of our minds. The media slides like worms into innate values of human vitality. My material is in paint and performance, nevertheless I need to speak because I don’t want to be here. The trap as a real place, the border guards are real, the surveillance cameras are real. We fight in the name of art through art. Time and space is still the province of the artist. Today the compression of both point to confusion. The need is to challenge the idea of a single and objective sense of time and space against which we can measure the diversity of human conceptions and perceptions. We need to step back a moment and look at the work that this man has done and is still doing today! Why is the clamour so silent? What are people afraid of? Afraid that they will be awakened to take action and to all start Codswalloping or Banksying their work? It is high time we open our doors and minds to change; there is no place for fear or inaction. The Art World is in a straitjacket. Locked in with no courage and limited vision, suffering from identity crisis and much ego. Check out http://www.newartexaminer.net. We try. Fear is in place. Though I find this article very challenging in more ways than one, I would very much like to read more writings by you. Where can I find them? Why the choice of the codfish as your symbol? Does the cod have some sort of special power for you like the Kwakiutl First Nations Indians believed? For them the lunar eclipse was “caused by a codfish trying to swallow the moon” and they would make “a large bonfire and add green boughs to produce dense smoke, which causes the codfish to cough and spit out the moon.” (from Jim Oooooo’s book, What I Did on My Summer Vacation Or North to Alaska: An Inside Passage Cruise, p. 102). Happy New Year to Ken Turner and the Codswallop Movement from the Cod Ladies! We look forward to your performance in Falmouth in the spring. Is there a date so that we can make our plane reservations? May I ask dear Cod Ladies who you all are and what your role is in the Codswallop Movement? I, too, would be interested in knowing the date of the next performance in Falmouth. You have all failed; just the fact that you are a group of 11 female artists says it all – hopeless, to say the least. Does it really matter that we are male or female artists? Perhaps you would like to join us in our endeavor. Come to Falmouth (UK) for the next Codswallop performance so that we can meet and perhaps go forward with a strategy to combat what we are talking about. Let’s hope that Ken Turner gives us a date soon for his next Codswallop performance so that we can organize in time. 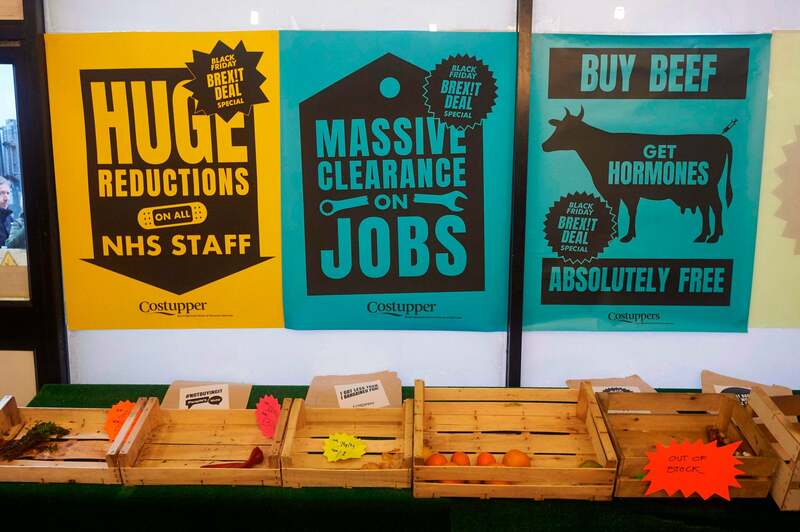 A Brexit minimart exhibition has opened in London under the name of Costupper. It has on display tired flowers, a couple of oranges in an empty crate, butter labelled with “I Can’t Believe the Price of this Butter”, “Conman’s Mustard”, “Tomato Botchup” and other items parodying how the shops will be after Brexit. Unfortunately, this highly creative exhibition closed yesterday after only 2 days. Knock, knock Mr Codswallop, are you there? Are you perhaps sleeping and letting it pass you by? Cod Lady here would like to know what you think. Come on and roll up your sleeves; get involved and bring out the cod in you. I’ve been waiting for weeks for you to get involved, but sadly, no further comment here from you. Did Banksy shred your tongue? What is it that attracts everyone to Codswallop? I’ve been following this phenomenon for a few months now and really do wonder. I think it might be the transgression from the mainstream art world, that frankly, has become boring. Codswallop appears to offer a window of creativity, stemming from the rebellious Ken Turner, who I understand is in his nineties. Does it take a 90 year old man to tell us that we are all sleeping and letting it pass us by? I think he has made his point and look forward to his next work. People are not only attracted to Codswallop, they are consoled that someone has opened up a platform for the truth. Looking at numbers, there have been over 5,000 readers of this article which is an indication of the power of the Codswallop message. I believe Ken Turner is really on to something.